JR Wirth was born and raised in Southern California. Now hailing from San Bernardino, he was intimately affected by the recent terror attacks, but luckily his family escaped physical harm. With several pieces published—including a poem and the bestselling series: “Twisted Family Holidays,” J R. Wirth is an emerging author. The Twisted Family Holidays anthology is a series of short stories that features a combination of real life situations and family, with a great imagination. It has been compared to the “Twilight Zone,” series and Charles Dickens. 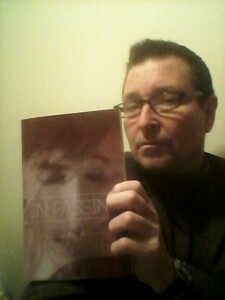 “In Passing” is his first full-length book release. The epic paranormal tale promises to be the best story yet. In all of his works, J.R. combines ordinary people with extraordinary circumstances, to create characters that will jump off the page and straight into the readers’ hearts and minds. Look for J.R. in Goodreads, Barns and Noble, and Amazon. I like telling stories and being creative. I also enjoy the momentary solitude that is crucial to the process. Whether I’m at home alone or at Starbucks full of strangers, I enjoy the writing process. And my family. I am a seat of the pants writer. I get an idea then I start and other ideas crop up and then others and soon I’ve got a creation. But I always know that the first version will be less than acceptable. So during the editing process (over and over) more ideas pop up and much fine-tuning occurs. I don’t talk to my characters, but I see them interacting with others and their faces when they move and communicate. Patience. I always had patience, but the writing and publishing process has been a manic snail’s run to nowhere sometimes. And not to expect a big payday, but if it happens that’s very cool too. I always wanted to publish through a publisher and now have been published through three: Ether books (short stories in England); Books to go Now (Twisted Family Holidays books and Jimmy’s Christmas Present); and Linkville Press — In Passing. The other published stuff has been through similar venues. I’m not sure I ever felt confident enough to self-publish. I think I also felt “confirmed” of sorts when I was finally accepted. I think, like music, people will get sick of owning a bit of electronic information, in a computer, which will be obsolete in a year. They will go back to hard copies, like albums, to have something tangible in a library. And the book will have a link for a download, in case they want to use their electronic device. What genres do you write? : paranormal, suspense, thriller, young adult, new adult, family, Christian, family saga, middle grade, often at the same time.